Italian patriot, born on the 22nd of June 1805 at Genoa, where his father, Giacomo Mazzini, was a physician in good practice, and a professor in the university. His mother is described as having been a woman of great personal beauty, as well as of active intellect and strong affections. During infancy and childhood his health was extremely delicate, and it appears that he was nearly six years of age before he was quite able to walk; but he had already begun to devour books of all kinds and to show other signs of great intellectual precocity. He studied Latin with his first tutor, an old priest, but no one directed his extensive course of reading. He became a student at the University of Genoa at an unusually early age, and intended to follow his father's profession, but being unable to conquer his horror of practical anatomy, he decided to graduate in law (1826). His exceptional abilities, together with his remarkable generosity, kindness and loftiness of character, endeared him to his fellow students. As to his inner life during this period, we have only one brief but significant sentence; "for a short time", he says, "my mind was somewhat tainted by the doctrines of the foreign materialistic school; but the study of history and the intuitions of conscience -- the only tests of truth -- soon led me back to the spiritualism of our Italian fathers." The natural bent of his genius was towards literature, and, in the course of the four years of his nominal connection with the legal profession, he wrote a considerable number of essays and reviews, some of which have been wholly or partially reproduced in the critical and literary volumes of his Life and Writings. His first essay, characteristically enough on "Dante's Love of Country", was sent to the editor of the Antologia Fiorentina in 1826, but did not appear until some years afterwards in the Subalpino. He was an ardent supporter of romanticism as against what he called "literary servitude under the name of classicism"; and in this interest all his critiques (as, for example, that of Giannoni's "Exile" in the Indicatore Livornese, 1829) were penned. But in the meantime the "republican instincts" which he tells us he had inherited from his mother had been developing, and his sense of the evils under which Italy was groaning had been intensified; and at the same time he became possessed with the idea that Italians, and he himself in particular, "could and therefore ought to struggle for liberty of country." Therefore, he at once put aside his dearest ambition, that of producing a complete history of religion, developing his scheme of a new theology uniting the spiritual with the practical life, and devoted himself to political thought. His literary articles accordingly became more and more suggestive of advanced liberalism in politics, and led to the suppression by government of the Indicatore Genovese and the Indicatore Livornese successively. Having joined the Carbonari, he soon rose to one of the higher grades in their hierarchy, and was entrusted with a special secret mission into Tuscany; but, as his acquaintance grew, his dissatisfaction with the organization of the society increased, and he was already meditating the formation of a new association stripped of foolish mysterious and theatrical formulae, which instead of merely combating existing authorities should have a definite and purely patriotic aim, when shortly after the French revolution of 1830 he was betrayed, while initiating a new member, to the Piedmontese authorities. He was imprisoned in the fortress of Savona on the western Riviera for about six months, when, a conviction having been found impracticable through deficiency of evidence, he was released, but upon conditions involving so many restrictions of his liberty that he preferred the alternative of leaving the country. He withdrew accordingly into France, living chiefly in Marseilles. While in his lonely cell at Savona, in presence of "those symbols of the infinite, the sky and the sea", with a greenfinch for his sole companion, and having access to no books but "a Tacitus, a Byron, and a Bible", he had finally become aware of the great mission or "apostolate" (as he himself called it) of his life; and soon after his release his prison meditations took shape in the program of the organization which was destined soon to become so famous throughout Europe, that of La Giovine Italia, or Young Italy. Its publicly avowed aims were to be the liberation of Italy both from foreign and domestic tyranny, and its unification under a republican form of government; the means to be used were education, and, where advisable, insurrection by guerrilla bands; the motto was to be "God and the people", and the banner was to bear on one side the words "Unity" and "Independence" and on the other "Liberty", "Equality", and "Humanity", to describe respectively the national and the international aims. In April 1831 Charles Albert, "the ex-Carbonaro conspirator of 1821", succeeded Charles Felix on the Sardinian throne, and towards the close of that year Mazzini, making himself, as he afterwards confessed, "the interpreter of a hope which he did not share", wrote the new king a letter, published at Marseilles, urging him to take the lead in the impending struggle for Italian independence. Clandestinely reprinted, and rapidly circulated all over Italy, its bold and outspoken words produced a great sensation, but so deep was the offense it gave to the Sardinian government that orders were issued for the immediate arrest and imprisonment of the author should he attempt to cross the frontier. Towards the end of the same year appeared the important Young Italy "Manifesto", the substance of which is given in the first volume of the Life and Writings of Mazzini; and this was followed soon afterwards by the society's Journal, which, smuggled across the Italian frontier, had great success in the objects for which it was written, numerous "congregations" being formed at Genoa, Leghorn, and elsewhere. Representations were consequently made by the Sardinian to the French government, which issued in an order for Mazzini's withdrawal from Marseilles (August 1832); he lingered for a few months in concealment, but ultimately found it necessary to retire into Switzerland. From this point it is somewhat difficult to follow the career of the mysterious and terrible conspirator who for twenty years out of the next thirty led a life of voluntary imprisonment (as he himself tells us) "within the four walls of a room", and "kept no record of dates, made no biographical notes, and preserved no copies of letters." In 1833, however, he is known to have been concerned in an abortive revolutionary movement which took place in the Sardinian army; several executions took place, and he himself was laid under sentence of death. Before the close of the same year a similar movement in Genoa had been planned, but failed through the youth and inexperience of the leaders. At Geneva, also in 1833, Mazzini set on foot L'Europe Centrale, a journal of which one of the main objects was the emancipation of Savoy; but he did not confine himself to a merely literary agitation for this end. Chiefly through his agency a considerable body of German, Polish and Italian exiles was organized, and an armed invasion of the duchy planned. The frontier was actually crossed on the 1st of February 1834, but the attack ignominiously broke down without a shot having been fired. Mazzini, who personally accompanied the expedition, is no doubt correct in attributing the failure to dissensions with the Carbonari leaders in Paris, and to want of a cordial understanding between himself and the Savoyard Ramorino, who had been chosen as military leader. In April 1834 the "Young Europe" association "of men believing in a future of liberty, equality and fraternity for all mankind, and desirous of consecrating their thoughts and actions to the realization of that future" was formed also under the influence of Mazzini's enthusiasm; it was followed soon afterwards by a "Young Switzerland" society, having for its leading idea the formation of an Alpine confederation, to include Switzerland, Tyrol, Savoy and the rest of the Alpine chain as well. But La Jeune Suisse newspaper was compelled to stop within a year, and in other respects the affairs of the struggling patriot became embarrassed. He was permitted to remain at Grenchen in Solothurn for a while, but at last the Swiss diet, yielding to strong and persistent pressure from abroad, exiled him about the end of 1836. In January 1837 he arrived in London, where for many months he had to carry on a hard fight with poverty and the sense of spiritual loneliness, so touchingly described by himself in the first volume of the Life and Writings. Ultimately, as he gained command of the English language, he began to earn a livelihood by writing review articles, some of which have since been reprinted, and are of a high order of literary merit; they include papers on "Italian Literature since 1830" and "Paolo Sarpi" in the Westminster Review, articles on "Lamennais", "George Sand", "Byron" and "Goethe" in the Monthly Chronicle, and on "Lamartine", "Carlyle", and "The Minor Works of Dante" in the British and Foreign Review. In 1839 he entered into relations with the revolutionary committees sitting in Malta and Paris, and in 1840 he originated a working-mens association, and the weekly journal entitled Apostolato Popolare, in which the admirable popular treatise "On the Duties of Man" was commenced. Among the patriotic and philanthropic labors undertaken by Mazzini during this period of retirement in London may be mentioned a free evening school conducted by himself and a few others for some years, at which several hundreds of Italian children received at least the rudiments of secular and religious education. He also exposed and combated the infamous traffic carried on in southern Italy, where scoundrels bought small boys from poverty-stricken parents and carried them off to England and elsewhere to grind organs and suffer martyrdom at the hands of cruel taskmasters. The most memorable episode in his life during the same period was perhaps that which arose out of the conduct of Sir James Graham, the home secretary, in systematically, for some months, opening Mazzini's letters as they passed through the British post office, and communicating their contents to the Neapolitan government -- a proceeding which was believed at the time to have led to the arrest and execution of the brothers Bandiera, Austrian subjects, who had been planning an expedition against Naples, although the publication of Sir James Graham's life seems to exonerate him from the charge. The prolonged discussions in parliament, and the report of the committee appointed to inquire into the matter, did not, however, lead to any practical result, unless indeed the incidental vindication of Mazzini's character, which had been recklessly assailed in the course of debate. In this connection Thomas Carlyle wrote to The Times: "I have had the honor to know Mr. Mazzini for a series of years, and, whatever I may think of his practical insight and skill in worldly affairs, I can with great freedom testify that he, if I have ever seen one such, is a man of genius and virtue, one of those rare men, numerable unfortunately but as units in this world, who are worthy to be called martyr souls; who in silence, piously in their daily life, practise what is meant by that." Mazzini did not share the enthusiastic hopes everywhere raised in the ranks of the Liberal party throughout Europe by the first acts of Pope Pius IX, in 1846, but at the same time he availed himself, towards the end of 1847, of the opportunity to publish a letter addressed to the new pope, indicating the nature of the religious and national mission which the Liberals expected him to undertake. 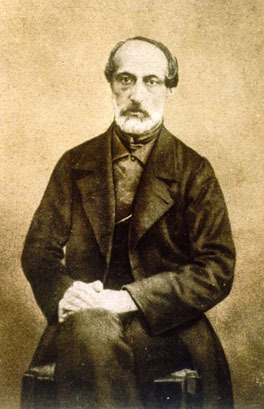 The leaders of the revolutionary outbreaks in Milan and Messina in the beginning of 1848 had long been in secret correspondence with Mazzini; and their action, along with the revolution in Paris, brought him early in the same year to Italy, where he took a great and active interest in the events which dragged Charles Albert into an unprofitable war with Austria; he actually for a short time bore arms under Giuseppe Garibaldi immediately before the reoccupation of Milan, but ultimately, after vain attempts to maintain the insurrection in the mountain districts, found it necessary to retire to Lugano. In the beginning of the following year he was nominated a member of the short-lived provisional government of Tuscany formed after the flight of the grand-duke, and almost simultaneously, when Rome had, in consequence of the withdrawal of Pius IX, been proclaimed a republic, he was declared a member of the constituent assembly there. A month afterwards, the battle of Novara having again decided against Charles Albert in the brief struggle with Austria, into which he had once more been drawn, Mazzini was appointed a member of the Roman triumvirate, with supreme executive power (March 23, 1849). The opportunity he now had for showing the administrative and political ability which he was believed to possess was more apparent than real, for the approach of the professedly friendly French troops soon led to hostilities, and resulted in a siege which terminated, towards the end of June, with the assembly's resolution to discontinue the defense, and Mazzini's indignant resignation. That he succeeded, however, for so long a time, and in circumstances so adverse, in maintaining a high degree of order within the turbulent city is a fact that speaks for itself. His diplomacy, backed as it was by no adequate physical force, naturally showed at the time to very great disadvantage, but his official correspondence and proclamations can still be read with admiration and intellectual pleasure, as well as his eloquent vindication of the revolution in his published "Letter to MM. de Tocqueville and de Falloux." The surrender of the city on the 30th of June was followed by Mazzini's not too precipitate flight by way of Marseilles into Switzerland, from where he once more found his way to London. Here in 1850 he became president of the National Italian Committee, and at the same time entered into close relations with Ledru-Rollin and Kossuth. He had a firm belief in the value of revolutionary attempts, however hopeless they might seem; he had a hand in the abortive rising at Mantua in 1852, and again, in February 1853, a considerable share in the ill-planned insurrection at Milan on the 6th of February 1853, the failure of which greatly weakened his influence; once more, in 1854, he had gone far with preparations for renewed action when his plans were completely disconcerted by the withdrawal of professed supporters, and by the action of the French and English governments in sending ships of war to Naples. The year 1857 found him yet once more in Italy, where, for complicity in short-lived �meutes which took place at Genoa, Leghorn and Naples, he was again laid under sentence of death. Undiscouraged in the pursuit of the one great aim of his life by any such incidents as these, he returned to London, where he edited his new journal Pensiero ed Azione, in which the constant burden of his message to the overcautious practical politicians of Italy was: "I am but a voice crying Action; but the state of Italy cries for it also. So do the best men and people of her cities. Do you wish to destroy my influence? Act." The same tone was at a somewhat later date assumed in the letter he wrote to Victor Emmanuel II, urging him to put himself at the head of the movement for Italian unity, and promising republican support. As regards the events of 1859-60, however, it maybe questioned whether, through his characteristic inability to distinguish between the ideally perfect and the practically possible, he did not actually hinder more than he helped the course of events by which the realization of so much of the great dream of his life was at last brought about. If Mazzini was the prophet of Italian unity, and Garibaldi its knight errant, to Cavour alone belongs the honor of having been the statesman by whom it was finally accomplished. After the irresistible pressure of the popular movement had led to the establishment not of an Italian republic but of an Italian kingdom, Mazzini could honestly enough write, "I too have striven to realize unity under a monarchical flag", but candor compelled him to add, "The Italian people are led astray by a delusion at the present day, a delusion which has induced them to substitute material for moral unity and their own reorganization. Not so I. I bow my head sorrowfully to the sovereignty of the national will; but monarchy will never number me amongst its servants or followers." In 1865, by way of protest against the still uncancelled sentence of death under which he lay, Mazzini was elected by Messina as delegate to the Italian parliament, but, feeling himself unable to take the oath of allegiance to the monarchy, he never took his seat. In the following year, when a general amnesty was granted after the cession of Venice to Italy, the sentence of death was at last removed, but he declined to accept such an "offer of oblivion and pardon for having loved Italy above all earthly things." In May 1869 he was again expelled from Switzerland at the instance of the Italian government for having conspired with Garibaldi; after a few months spent in England he set out (1870) for Sicily, but was promptly arrested at sea and carried to Gaeta, where he was imprisoned for two months. Events soon made it evident that there was little danger to fear from the contemplated rising, and the occasion of the birth of a prince was seized for restoring him to liberty. The remainder of his life, spent partly in London and partly at Lugano, presents no noteworthy incidents. For some time his health had been far from satisfactory, but the immediate cause of his death was an attack of pleurisy with which he was seized at Pisa, and which terminated fatally on the 10th of March 1872. The Italian parliament by a unanimous vote expressed the national sorrow with which the tidings of his death had been received, the president pronouncing an eloquent eulogy on the departed patriot as a model of disinterestedness and self-denial, and one who had dedicated his whole life ungrudgingly to the cause of his country's freedom. A public funeral took place at Pisa on the 14th of March, and the remains were afterwards conveyed to Genoa. The published writings of Mazzini, mostly occasional, are very voluminous. An edition was begun by himself and continued by A. Saffi, Scritti editi e inediti di Giuseppe Mazzini, in 18 volumes, published at Milan and Rome, 1861-91; many of the most important are found in the partially autobiographical Life and Writings of Joseph Mazzins (1864-70) and the two most systematic -- Thoughts upon Democracy in Europe, a remarkable series of criticisms on Benthamism, St. Simoniansm, Fourierism, and other economic and socialistic schools of the day, and the treatise On the Duties of Man, an admirable primer of ethics, dedicated to the Italian working class -- will be found in Joseph Mazzini: a Memoir, by Mrs. E. A. Venturi (London, 1875). Mazzini's "first great sacrifice", he tells us, was the "renunciation of the career of literature for the more direct path of political action", and as late as 1861 we find him still recurring to the long-cherished hope of being able to leave the stormy arena of politics and consecrate the last years of his life to the dream of his youth. He had specially contemplated three considerable literary undertakings -- a volume of Thoughts on Religion, a popular History of Italy, to enable the working classes to apprehend what he conceived to be the "mission" of Italy in God's providential ordering of the world, and a comprehensive collection of translations of ancient and modern classics into Italian. None of these was actually achieved. No one, however, can read even the briefest and most occasional writing of Mazzini without gaining some impression of the simple grandeur of the man, the lofty elevation of his moral tone, his unwavering faith in the living God, who is ever revealing Himself in the progressive development of humanity. His last public utterance is to be found in a highly characteristic article on Renan's R�forme Morale et Intellectuelle, finished on the 3rd of March 1872, and published in the Fortnightly Review for February 1874. Of the 40,000 letters of Mazzini only a small part have been published. In 1887 two hundred unpublished letters were printed at Turin (Duecento lettere inedite di Giuseppe Mazzini), in 1895 the Lettres intimes were published in Paris, and in 1905 Francesco Rosso published Lettre inedite di Giuseppe Mazzini (Turin, 1905). A popular edition of Mazzini's writings was later undertaken by order of the Italian government.